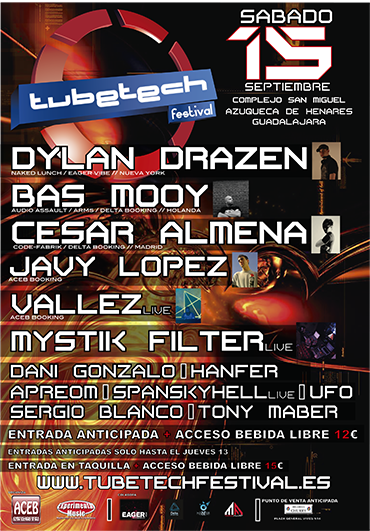 Tomorrow I will be playing in Guadalajara, Spain at their annual Tube Tech Festival. I’ll be performing alongside some old friends, like NL techno giant Bas Mooy, and Cesar Almena from Code in Madrid. It’s an outdoor festival about 45 minutes from Madrid. It’s the kind of situation I’m used to, but for me it will be an entirely new experience. It will be my first gig where I’ll be DJing from a computer. Wait, what year is it? Ok, maybe a little history is in order. When I started DJing in 1993, it was all about vinyl of course. And the vinyl rocked strong for 13 years. By 2003 I started to integrate CDs into my sets, and from 2003-2006 my sets became heaver on the CD side than the vinyl side. In 2006 I bought my last piece of vinyl. And from 2006 until this day, I have been playing pretty much exclusively CDs. I did buy Serato in 2005 and used it quite a bit for studio sessions, and did use it for the occasional small gig in NYC where I wanted my entire classic house library at my fingertips. And, alright, there was that one party in Malaga in 2006 when they wanted tribal house and I was too lazy to burn up a bunch of CDs I knew I’d never use again, so that’s the one time I used Serato overseas. But the idea of having to deal with all those cables, a box, and using a CD or vinyl as an interface never really turned me on. I loved it for studio use, or if I had a local residency someplace where burning lots of CDs on a regular basis would become impractical. But since most of my bigger gigs would usually only come once every month or so, dealing with a computer and the setups and all the variables and potential problems just weren’t worth it for me. In my last entry about this, I mentioned how friends would tell me how much more would be possible when performing with a computer, but I fought it for a long time. I guess I’m very old school when it comes to being a DJ. But now it’s getting ridiculous, and like I said, when I saw someone at WMC this year rocking the S4, I was instantly sold. So I finally bought one and learned it. Although I’ve had experience with both Serato and Ableton, Traktor is its own beast. And what a beautiful beast it is. At first I was wholly intimidated, what with all its options, knobs, and modifiable mappings. But I just took it one thing at a time and now I’m (almost) comfortable, thanks mostly to Ean Golden from DJTechTools and his fantastic training videos. The timing is funny, though. 12 years on Vinyl, 6 years on CD. What will happen in 3 years? I’m still bringing CDs as backup and shoved all my songs on a stick just in case, but I think it’s really happening this time. Me and Traktor on a stage.